Auburnale Speedway celebrated its 75th Anniversary Saturday evening in front of an enthusiastic crowd, so enthusiastic that the track ran out of hot dogs (priced at 75 cents for the night) before the races actually got under way! The big event of the night was the 50-lap contest for the Sunshine State Challenge Series (SSCS) Modified Mini Stocks and it was point leader Chris Spring of Auburndale setting quick time at 15.357 seconds. Lakeland’s Chuck Frazier was second fastest at 15.422 followed by the 15.646 lap of Tampa’s Ken Nurse, Jr. Jeff Firestine and Mike Kerrivan were fourth and fifth quick. Things got off to a rocky start, though, as the plug came out of the oil cooler of Brandon Yates’ car coating the upper groove of the track with oil yet going unnoticed by the drivers and officials. As the field took the green and headed into turn one, the cars in the outer groove all went for wild rides. Kerrivan got the worst of it taking a hard shot into the concrete with the right rear of his machine. Jimmy Frazier also nosed into the wall but continued after a brief check of his racer. At this point, it was going to be a lengthy clean-up, so the field was sent back pit side and the intermission was moved up to take place while the track surface was made race-ready. In order to allow drivers involved to make repairs, the Mod Mini race was moved to the end of the night’s race schedule. Eventually the cars got back on track and it was Nurse who took the early lead only to see Spring zip by him for the top spot on the third lap. Frazier followed suit one lap later as he moved into second ahead of Nurse and Firestine. They continued to run in order until the only caution flag of the event was thrown for a slowing Yates on lap 19. Yates’ car was pushed back to the pits where he joined Jimmy Frazier who had fallen out earlier. On the restart, Nurse suddenly pulled into the infield while running third and called it a night. From there it was all green flag racing as Spring led the remaining laps easily to score the victory and add to his point lead. Frazier was a comfy second, well ahead of third place Firestine who ran the second half of the contest with no brakes. Fourth went to Kerrivan after his crew did a fantastic job of repairing his car after his earlier fling with the wall. Scott Bumgardner took the checker in fifth and was trailed by Rachelle Rudolph, David Myers, Sr., Nurse, Yates and J. Frazier. The other big race of the night was the 50-lap run for the V-8 Bombers presented by Allgate Solutions. Making his first start of the season here, Nick Malverty of Spring Hill drove the Mike Hubbard Special to fast time with a lap of 16.492 seconds just a tick of the watch faster than the 16.531 lap turned in by Ferndale’s Kyle Peters. SSCS V-8 Bomber point leader George Gorham, Jr. of Winter Haven opted to leave his own car home since this was not an SSCS point race but got the opportunity to drive Bubba Healey’s new Camaro and he set third quick time at 16.567 just ahead of Danny Burchfield and Auburndale Speedway V-8 Bomber point leader James Wright III. Burchfield snared the early lead and was looking strong while Wright, who was not very happy with his qualifying effort, trailed closely eventually slipping by Burchfield on the 12th lap. The race went all the way to lap 28 without a caution before Brey Holmes looped his machine in turn two. Three laps after the restart, Gorham and Peters snuck under Burchfield to take over the second and third spots. On lap 33, Wright suddenly slowed and pulled out of the event as he lost second gear in the transmission. Gorham took over the lead just before the second, and final, caution of the race came out for a turn two tangle between Healey (in his back-up Chevelle) and Adam Briggs. Both were able to continue. Despite fading brakes, Gorham was able to hold Peters at bay to score the win. “He (Peters) had a chance to just knock me out of the way and he probably should have,” said Gorham. “But he doesn’t drive like that… he races you clean and I can appreciate that,” Gorham continued. Burchfield came home with a solid third place effort while Jody Gill had the drive of the night. Gill missed practice and qualifying, started last on the grid and drove his way to a nice fourth place finish, just ahead of Makverty who never seemed to get fully on track during the race. Sixth went to Holmes trailed by Briggs, Healey, Ronnie Abney, Wright, Jeff McCaw, Ricky Norman and Brandon Duchscherer. Chris Narramore, Sr. led all the way to win the Q Mini Stock feature and add to his already insurmountable point lead. Narramore dedicated his victory to his uncle, Roger Guy, who passed away earlier in the week. John Cummins, Jr. had yet another runner-up finish trailed by Bruce Cozad, Matt Cummins and Fred Martin. Donald Gatlin, who was a strong second to Narramore in the heat, did not start the feature after a problem was detected with his carburetor. Dustin Wilson grabbed the lead from Keith Cantrill on lap eight then went on to score his 10th Scrambler win of the season. Cantrill stayed close but had to settle for second ahead of William Kerns, Chris Falkner and Gene Connell III. Wilson also won the heat race. 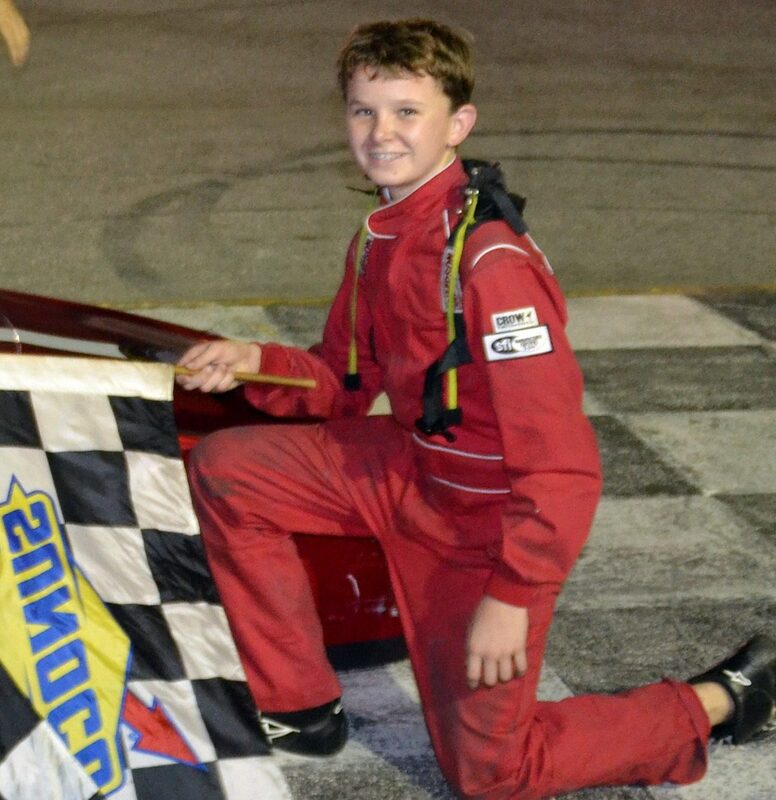 The Mini Cup feature had its share of yellow flags but when all was said and done, 13-year-old Douglas Herrin, Jr. had scored his first career feature win after coming close so many times before. Heat winner Russell Bush had to settle for second on this night while Maria Martins impressed everyone by driving hard to third place in her first-ever feature race of any kind. Easton Bush, also in his first-ever race, was fourth with Clay Samuels fifth.